On their first episode of the 2018 offseason, the Helpers discuss free agency signings and which ones have the best chance to generate tons of fantasy points. Want to win more money in Daily Fantasy sports? It's time to embrace analytics. Philadelphia Eagles coach Doug Pederson has an analytics guy, and he just won a Super Bowl. Use the promo code FFHelpers and receive your first month for just $9.99. On the final 2017 episode, the Helpers dole out their awards for the 2017 Fantasy playoffs. This year's titles include the '11th hour,' the 'we can't complain to that guy on Twitter anymore,' the 'where did that guy come from' and the honorable 'sweet streams are made of these' mention. Hope this season was a successful one for you all. But that's not really mathematically possible, but you still probably had fun and that in and of itself...is a success. Tired of getting beat my sharks on big name daily fantasy sites like Draftkings and Fanduel? Use the promo code 'FFHelpers' and play Daily Fantasy Football at DRAFT a daily fantasy website that gives you an 80 percent better chance to win based on the payout structure. On this week's episode, we help you understand that the playoffs are here. Then we tell you what will happen. Listen to us. Also, check out DRAFT, a daily fantasy website that you can actually win money on unlike DraftKings and FanDuel. On the fantasy pod, Scott and George discuss waiver QBs, why there's no reason to not pickup Jamaal Williams, and why this season is still whack. Link to original photo. The Helpers discuss Week 7 of the fantasy football season. They mention how this week was actually normal and there wasn't as many surprises, except for Amari Cooper. Visit Mybookie.AG and use the promo code 'FFHelpers' for a 100% bonus. Stop guessing and start winning. Numberfire.com. Use the promo code 'FFHelpers' and your first month subscription for $9.99. Check out more Fantasy Football Helpers podcasts here. Link to original photo here. On this episode of the Helpers pod, George and Scott discuss how weird the NFL season has been so far. They also talk about surprising hits and surprising bust players. Visit Mybookie.AG and use the promo code 'FFHelpers' for a 100% bonus. Stop guessing and start winning. Numberfire.com. Use the promo code 'FFHelpers' and your first month subscription for $9.99. Check out more Fantasy Football Helpers podcasts here. Link to original photo. On Tuesday's Week 4 recap pod, the Helpers discuss the great receiving backs and why you should consider starting a few of them. They also talk about Ben Roethlisberger's road woes and why Jacksonville's defense is vulnerable. All that, plus their Dangggg player of the week and some waiver wire adds. Visit Mybookie.AG and use the promo code 'FFHelpers' for a 100% bonus. Stop guessing and start winning. Numberfire.com. Use the promo code 'FFHelpers' and your first month subscription for $9.99. Check out more Fantasy Football Helpers podcasts here. On Tuesday's Week 3 recap pod, the Helpers discuss the protests in response to Donald Trump's twitter comments. They discuss the weird week that was with many 0-2 teams winning in surprise fashion. They also talk about trends to feast on, including why the New England Patriots are one of the best teams to play against in fantasy so far. All that. plus waiver wire pickups and buy-low candidates. Visit Mybookie.AG and use the promo code 'FFHelpers' for a 100% bonus. Stop guessing and start winning. Numberfire.com. Use the promo code 'FFHelpers' and your first month subscription for $9.99. Check out more Fantasy Football Helpers podcasts here. Link to original photo. The 2017 NFL season has begun. It's time for us to start helping you win in Fantasy Football. Here, we discuss all the matchups this week with the highest scoring potential. We tell you which players we're high and low on. We also tell you to visit the following websites... Visit Mybookie.AG and use the promo code 'FFHelpers' for a 100% bonus. Stop guessing and start winning. Numberfire.com. Use the promo code 'FFHelpers' and your first month subscription for $9.99. 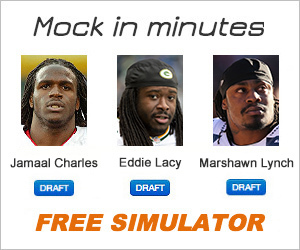 To do your own Mock Draft for FREE, visit Fantasypros.com and try out their DraftWizard tool. Check out more Fantasy Football Helpers podcasts here. Link to original photo. Episode 184: Draft a quarterback early and lose your league? George and Scott Sergent give you the strategies to employ in your fantasy football draft through their Mock Drafts. Overall, it's important to focus on three major things when drafting in standard, redraft leagues and they cover all of them in this episode. To do your own Mock Draft for FREE, visit Fantasypros.com and try out their DraftWizard tool. Check out more predictive stats at Numberfire.com. Use the promo code 'Welcome' and receive the best predictive stats all at your fingertips for $9.99. Check out more Fantasy Football Helpers podcasts here. Link to original photo.